Knowing that the main course is one big roasted pig, planning out the accompanying dishes presented an interesting challenge. They should complement the flavors of the main event, not supplant yet, yet should stand well on their own, as we weren't sure if the pig would be ready when everyone got there (I don't care what the cooking guidelines you have for making turkey, that doesn't apply to a 50 pound pig). Moreover, they shouldn't be so involved that we cannot devote attention to the pig itself (good thing, too, as a later anecdote will tell. We chose simplicity and seasonality. Above is pictured an edamame dip; it's a really simple dish. Blanch a package of frozen shelled edamame in salted boiling water (I actually let the beans thaw on the counter, but really, you can do that straight from the freezer), about 2-4 minutes. Drain, and put it directly in the bowl of a food processor. Then add the juice of one lemon, a couple of garlic cloves, half an onion (we were out of those, so I threw in an shallot instead), a handful of fresh mint leaves, a good squirt of sriracha hot sauce, and some some salt. Pulse to get the grinding started, scrape down the sides, and start processing, and pour in olive oil until the right consistency (should mound up easily on a stick of celery). Adjust for seasoning, and then, it's ready to serve with crudite and crackers. Really, it took longer to cut up the celery and carrot sticks. What else should go with the pig? We're looking for acid and fruitiness...and it's summer in Southern California, so tomatoes were in full force. 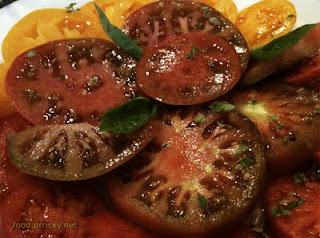 We got these gorgeous heirlooms, and supplemented them with some from the garden. 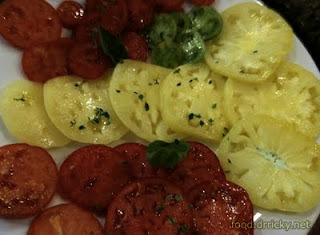 If you have tomatoes this good...don't mess with a good thing. We did a simple carpaccio - cut them up, lay them out on a plate, sprinkle some fresh herbs in it (thyme and basil here), drizzle some olive oil over, and just before serving, some good coarse salt (I brought in volcanic Cypriot salt the McBardo household). Lay these out, and it's easy to keep everyone entertained should the pig be late. But it wasn't late. Not by a long shot. 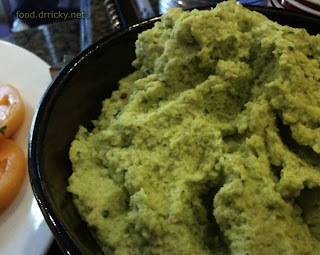 Edamame dip was excellet and a beautiful green color!